Working in partnership with Broxbourne Borough Council and Hertfordshire Local Enterprise Partnership this business centre offers 25,000 sq. ft. of high-quality office space separated into studios and offices from 150 to 500 sq. f.t Just a short walk from the mainline train station. 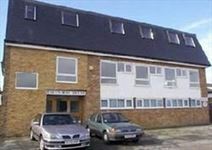 Set close to the River Lea, this is an idyllic setting for your business. This modern building houses flexible furnished serviced offices. Transport connections are excellent, with easy access to Motorways and the mainline railway service in London. These serviced offices provide prestigious and furnished space ideal for small businesses. The setting is beautiful, in the Park Rye area of Hoddesdon and are just 300 yards from the mainline station. Flexible terms are on offer so no long-term leases required.